The Winter Olympics in south Korea which took place this month (February 2018) may well go down in history as the ‘reunification Olympics’. Events have given real hope that progress will be made at last towards reunification of Korea, a project dear to patriots both south and north of the 38th parallel that has separated the country since the end of the Second World War. US President Trump’s complete lack of diplomatic skills has been contributing significantly to this development. Trump’s blustering threats to launch a nuclear attack on the North that have been his response to the DPRK’s growing nuclear capacity have had a most salutary effect on the DPRK’s neighbours, particularly South Korea. While the DPRK was upgrading its nuclear deterrent to make clear to US imperialism that, were it attacked, it would be able to respond by effective targeting of any city on the US mainland, US imperialism simply could not accept that it was not possible to prevent a tiny country such as the DPRK from making itself effectively impregnable; that it was simply not possible to force it to disarm itself, deceptive ‘diplomacy’ having totally failed. “America is drawing up plans for a ‘bloody nose’ military attack on North Korea to stop its nuclear weapons programme, The Telegraph understands. “The White House has ‘dramatically’ stepped up preparation for a military solution in recent months amid fears diplomacy is not working, well-placed sources said. “One option is destroying a launch site before it is used by the regime for a new missile test. Stockpiles of weapons could also be targeted. “The hope is that military force would show Kim Jong-un that America is ‘serious’ about stopping further nuclear development and trigger negotiations. “Three sources – two former US officials familiar with current thinking and a third figure in the administration – confirmed military options were being worked up. “’The Pentagon is trying to find options that would allow them to punch the North Koreans in the nose, get their attention and show that we’re serious’", said one former US security official briefed on policy.” (Ben Riley Smith, ‘Exclusive: US making plans for “bloody nose” military attack on North Korea’, The Telegraph, 20 December 2017). Since everybody believes that Donald Trump actually is mad enough to put such a plan into effect, alarm and despondency spread like wildfire in countries allied to the US but which would be bound to be severely affected in the event of any such attack – particularly south Korea! The fear was compounded when at the end of January the “Trump administration abruptly dumped its appointee for US ambassador to South Korea, Victor Cha [an unimaginably right-wing hawk and committed enemy of the DPRK], after he voiced opposition to a pre-emptive strike on North Korea. Cha subsequently went public, penning a comment in the Washington Post in which he warned that a US attack would put 230,000 Americans in South Korea at risk—equivalent to a medium-sized city like Pittsburgh or Cincinnati” (Peter Symonds, ‘Trump considers “bloody nose” strike on north Korea’, Global Research, 6 February 2018). After all: “The Seoul metropolitan area‘s 25 million residents, including 200,000 U.S. citizens, are vulnerable to North Korean conventional attacks, given its location a mere 35 miles from the Demilitarized Zone …” (Jung H. Pak, Sue Mi Terry, and Bruce Klingner. ‘Ex-CIA analysts explain why a bloody nose policy on North Korea would backfire’, USA Today, 12 February 2018). The Financial Times too has pointed out: “James Stavridis, former Nato supreme allied commander … sees [in relation to Korea] ‘no military options which would result in fewer than several hundred thousand casualties and perhaps as many as 2-3 million’” (Trump and north Korea: the perils of a pre-emptive strike by Demetri Sevastopulo, 9 January 2018). It seems that the Trump team have been toying with the illusion that if they went for only a limited strike, the DPRK would not hit back because to do so would obviously condemn the entire country to obliteration. The Financial Times, however, endorsed the view that “Mr Trump’s team would be taking a huge gamble if it assumed Mr Kim would not respond to an attack. ‘Our intelligence is not great, so how do we know that they would not respond?’ he says. ‘If I was Japan or south Korea, I would be asking ‘What are we, chopped liver?’ The US is supposed to be protecting them’” (op.cit.). “Thae Yong-ho … has said that an overwhelming response to a preventive or pre-emptive strike is programmed into Pyongyang’s military doctrines. “’North Korean officers are trained to press their button without any further instructions from the general command if anything happens on their side’, Thae told the House foreign affairs committee last week” (Julian Borger, ‘Democrats perturbed by Trump’s threat of pre-emptive North Korea strike’, The Guardian, 8 November 2017). The whole nuclear issue has demonstrated to south Koreans that US imperialism cares nothing for them, unlike the government in the north, which has pointed out that its nuclear weapons would never be used against the south. “At the meeting, which lasted 11 hours, the delegations from the divided country agreed on the participation of athletes from the DPRK in the Winter Olympics. They also discussed other issues related to improving relations such as the possible reunification of families separated by the Korean War. The parties also agreed to hold talks between army officials to discuss ways to avoid dangerous military incidents…. “Time and again, the DPRK has made it clear that its nuclear program was only meant as a deterrent from possible nuclear attack from the United States, the only country in history that has used nuclear bombs against civilian populations. It is only reasonable for the DPRK to take the threat seriously and take measures in self-defence” (International League of Peoples’ Struggle, ‘We support the peaceful reunification of Korea, we demand US withdrawal and end to the state of war’, 10 February 2018). “To South Koreans, they [north Korean leaders] are remote and impenetrable personalities, glimpsed occasionally at military parades and vast party gatherings, but without evident human qualities. And yet here they were, in the flesh, a twinkly old man and attractive young woman” (Richard Lloyd Parry, ‘Goodwill is Olympian effort as Games bring foes together’, The Times, 9 February 2018). The south Korean press were mesmerised by the cheerleaders, all exceptionally beautiful young ladies, and “journalists were determined to crack one of the great mysteries of our time: what are North Koreans really like?” Much to their amazement they discovered “The most surprising thing of all is how calm, polite and normal they turn out to be”… Moreover, in the opinion of Mr Lloyd Parry, “The cheerleaders turned what might have been a depressing occasion — an 8-0 defeat for the united Korea women’s ice hockey team at the hands of Switzerland — into an unforgettable one” (op.cit.). US imperialism was furious but all its efforts to cast a shadow over the proceedings came to absolutely nothing. “Mr Pence came to Pyeongchang with the stated mission of preventing North Korea from ‘hijacking the message and imagery of the Olympic Games’…. The US vice-president gave the impression of trying to undermine Mr Moon’s efforts to welcome the North Koreans by choosing to meet defectors and visit monuments to South Koreans killed by the North. He also brought as his guest the father of Otto Warmbier, an American student who died after being imprisoned in Pyongyang. However, his efforts had no obvious effect on warm meetings between Mr Moon and his visitors”. Pence’s efforts backfired. The Times remarked that “… the most interesting element of the opening ceremony of the Winter Olympics was not the performances in the stadium, but the drama in the VIP box far above it.” (Richard Lloyd Parry, ‘Goodwill is Olympian effort as Games bring foes together’, 9 February 2018). What was interesting is that Mike Pence, representing the US government at the Games, let the fury of US imperialism show only too clearly: “…US vice-president, Mike Pence, … over the past three days has given the impression of being in a medal-winning Olympic sulk” (ibid.). “On entering the VIP box, the South and North Koreans exchanged handshakes and smiles of what looked like genuine pleasure. After the theatrics of the opening ceremony came the athletes’ parade and Mr Pence stood to applaud the US delegation. Mr Abe rose for the Japanese. Then came the climax – North and South Korean athletes marching together under a ‘unification flag’. Everyone in the VIP box rose to their feet – except the US vice-president and Japanese prime minister” (ibid.). Worse: at “a dinner hosted by Mr Moon for the cream of the VIPs … Mr Pence had been given a place at the top table, with the North Koreans. The vice-president was clearly not keen. ‘He was going to leave immediately … but President Moon urged him to ‘see friends’ so he dropped by the reception venue briefly.’ He arrived late, ‘exchanged greetings with those seated at the head table, and left without sitting down’” (ibid.). Despairingly the New York Times quoted Mintaro Oba, a former diplomat at the State Department specialising in the Koreas, who pointed out that Mr. Pence is playing “right into North Korea’s hands by making it look like the U.S. is straying from its ally and actively undermining efforts for inter-Korean relations” (Motoko Rich and Cheo Sang-hun, ‘Kim Jong-un’s sister turns on the charm, taking Pence’s spotlight’, 11 February 2018). “Speaking to Fox News, the strategic analyst said: ‘If we act now, whether it be unilateral military action or anything else, we are the bad guys’” (Aurora Bosotti, ‘North Korea threat: US admits DEFEAT as Kim regime wins charm offensive at Pyeongchang’, 13 February 2018). 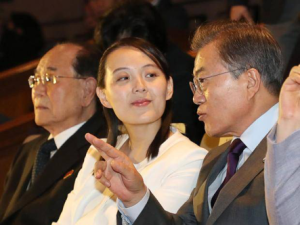 Before returning home, Kim Yo-jong had issued an invitation to President Moon to visit Pyongyang, and the representatives of US imperialism are having to console themselves with the thought that he did not immediately accept, with Pence bragging that Moon was as committed as the US to forcing the DPRK to give up its nuclear capability. “’There is no daylight between the United States, the Republic of Korea and Japan on the need to continue to isolate North Korea economically and diplomatically until they abandon their nuclear and ballistic missile programme,’ Mr Pence told reporters on his flight home. ‘I leave here very confident that we are going to continue to do the things we’ve known have to be done to continue to pressure North Korea to abandon their nuclear ambitions’” (Richard Lloyd Parry, 12 February 2018, op.cit.). But President Moon has his own constituency to please, many of whom cannot fail to have realised that the DPRK’s nuclear arsenal is deterring a US imperialist attack that would hurt not only the DPRK but also the south. While no doubt anxious not to go too far in provoking the US, “Mr Moon is walking a political tightrope as he seeks to achieve his cherished goal of engaging directly with the North Korean regime while staying on good terms with the US. Over the past few days it is the latter task that has proved more difficult” (ibid.). “Kim Jong Un has accomplished five things from all of this. “First, he has reopened the idea of substantive talks between North and South Korea. If they do go ahead, who knows where they lead? “Second, by doing so, he has exploited the real divisions in strategy that exist between South Korea on one side and Japan and the U.S. on the other. “Third, he has made it politically more difficult for the U.S. to launch even a limited military strike against the North. It’s hard to dismiss Kim as a dangerous madman when he is behaving so reasonably. “Fourth, he has reminded the South that Northerners are not all monsters and that people on both sides of the border share a common, fierce nationalism. “Fifth, he has done all of this without even suggesting that he might give up nuclear weapons.” (Thomas Walkom, ‘North Korean charm offensive puts U.S. in a bind’, Toronto Star, 14 February 2018). It is our earnest hope that President Moon will not allow himself to be bullied by the US into turning away from the path of reunification on which he has now so boldly embarked. He was elected because most south Koreans long for reunification. The DPRK’s reunification policy is for a new state of Koryo to be established, which would embody both economic systems – communism in the north and capitalism in the south, a state which, however, would brook no outside interference from any country in its internal affairs, and would certainly not tolerate the presence of foreign troops and armaments on its soil. Korea was unjustly divided after the second world war as a result of US imperialist occupation of the south. It is high time that injustice was reversed.